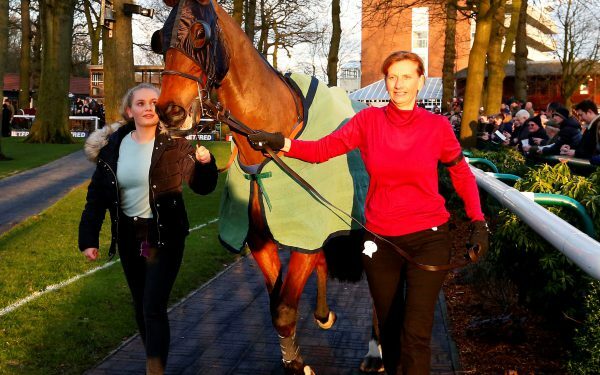 Improving riders’ welfare has been a constant on Clare Hazell’s ‘to do’ list and here she reveals her passion for taking up a new challenge with the Injured Jockeys Fund. My earliest memory of racing is the annual family Easter Monday pilgrimage to the Old Berks Point-to-Point. We were fortunate to often be sent a car pass, having supported the Old Berkshire Hunt and puppy-walked for them during the summer. It actually didn’t matter if no pass arrived, as my father would simply hand a whisky to the gate attendant and we would be waved in! It is an event I have only missed on a handful of occasions in my life, and will never forget winning the £5 prize for selling the most race cards on the day – a feat my daughter, Emma emulated about 30 years later. I considered myself to have been a brave rider in my teens, both out hunting and team chasing, so it was a natural progression to want to compete in the members’ race on that special Easter Monday. In stepped the late John Bosley, a professional trainer and a relative who advised that my plan would only end in tears and that it was best if I went to ride out for him instead. So from then on my school holidays were spent with John and his wife Sylvia, riding out three lots and going racing. I knew at that time that a career in racing was for me. After A levels and a year at agricultural college, I secured the position of secretary to Lambourn trainer, Nick Gaselee, where I was for three seasons. It was the perfect time to be in the yard as we celebrated Party Politics’s National win and I met my husband Mat, one of the struggling stable jockeys! My association with jockeys was only just starting, as I was within the first intake of racing secretaries to join the newly-formed, and firstly controversial National Jockeys Booking Agency (NJBA) set up at the Jockeys Association (JAGB). After nine years, I was made supervisor of the team, but by then the principle of overnight declaration of jockeys was accepted and the office was closed in favour of a more automated system. Having found my niche under the roof of the JAGB, I had no intention of leaving and was very pleased to be taken on by CEO Michael Caulfield and Ann Saunders when an opportunity arose to join the team. I remained at the JAGB (renamed the Professional Jockeys Association in 2008) for 12 years, assisting with the promotion, protection and representation of professional jockeys; dealing with their insurances, savings, and, of course, the much-cherished car stickers and metal badges! It was an honour to work with the Jockeys Employment and Training Scheme (JETS) at this time, too. JETS is now a charity in its own right and is joint-funded by The Injured jockeys Fund. It is a fantastic service, supporting jockeys to plan their training and future careers. It gave me great satisfaction to represent the PJA on Industry groups such as the BHA Welfare and Training Group and to play a small part in raising standards and improving services available to jockeys. One key development during my time was expanding the physiotherapy service on racecourses, so important to jockeys race-riding and in rehab following injury. Following a brainstorming session at the Jockey Club Rooms in Newmarket with CEO John Blake and Rabbit Slattery, the ‘Flying Physios’ was renamed The Jockeys Injury Management (JIM) Team. A sub-Committee was set up from across industry that resulted in a team of highly qualified physiotherapists being recruited and 100% coverage at National Hunt Fixtures. My life came full circle in 2014 when I took up a position in Point-to-Point, racing between the flags as they say. Through my role at the Point to Point Authority (PPA) I was pleased to be able to galvanise support for a number of key welfare initiatives to ensure rider safety. Together with the PPA’s Medical Advisor, we have reviewed and revised the current medical provision on race days. The PPA has worked hard to promote opportunities within the sport, forming a union with JETS to share openings with former jockeys, such as course inspector, steward, starter or judge. We don’t want the sport as a whole to lose out on the skills and experience of former riders. Increasing professionalism is behind giving riders access to training via professional BHA Jockey Coaches; we have also initiated and developed a new competency assessment process for first time Riders, which will be up and running this autumn. Point-to-Point racing is a much loved amateur sport which welcomed over 225,000 people to over 170 fixtures the length and breadth of Britain to enjoy a unique day at the races. It is a crucial piece of the rural economy and social fabric and all who are involved are proud of its heritage. So many fixtures focus on making it an enjoyable day out for families and providing, where possible, cover against the weather and activities alongside the racing. After all we are in the entertainment business! The hard work of so many volunteers who keep the show on the road and give up so much of their time underpins the success of the sport, and it has been a privilege to work with, and represent the Point-to-Point community over the past four seasons. I was particularly pleased last year that the PPA formed a partnership with Racing to School to encourage young people’s involvement with the sport through the charity’s education programme. The sport is at the heart of its communities. Throughout my career I have been passionate about the work of the Injured Jockeys Fund, having seen at first-hand their support for the sport’s participants and their dependants. It needed to be something very special to persuade me to leave the PPA and that came along with the offer to become Manager at Oaksey House, the IJF’s flagship rehabilitation centre in Lambourn. It is a position that will allow me to draw together all my past experience to try to make a significant contribution to the charity. I have always enjoyed working alongside the charity, and it has been a long-time ambition of mine to contribute to work that makes a measurable difference to the lives of those whose role defines our sport. It is an exciting time as we approach the Centre’s first decade of serving the sport. Everyone who walks through the door can be sure of a warm welcome, although I can’t vouch for the quality of my tea!